The Drexel University men’s tennis team took on city rival the University of Pennsylvania at the Hecht/Hamlin Center March 3. Despite a spirited fight, the men dropped the match, 5-2. 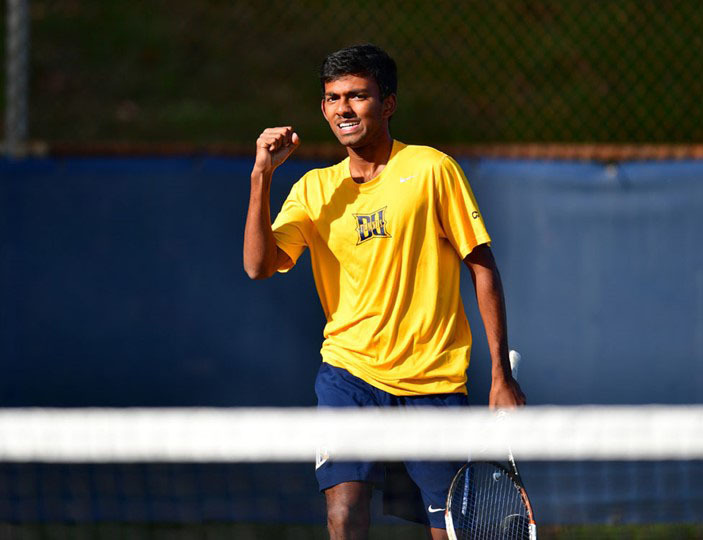 The partnership of freshman Sanil Jagtiani and senior Balaji Lakshmanan did enough to secure one of the three doubles matches in a tiebreak, 7-6(6). However, without that crucial second win, this was not enough to snag the doubles point. In the singles, three tough defeats at the top of the ladder meant that the team was pushed further into the back foot. An impressive performance from junior Sinan Orhon at No. 4 took the point from Penn’s Noah Makarome 6-3, 3-6, 7-6(7). With another tiebreak win, this time in the second set, No. 5 graduate student Bernard Tefel continued this success by defeating Aleks Huryn 6-3, 7-6(7). Despite late comeback efforts, the Dragons couldn’t make up the deficit and the Quakers took the win in their first match of the weekend. The men’s team didn’t have to wait long for a shot at redemption, as they faced off against Bucknell University the very next day March 4 at the same facility. This time, victory was sweet as they cruised past the the Bison, 6-1. The men’s win was the 63rd of head coach Mehdi Rhazali’s career with the Dragons, surpassing former coach Al Laverson for the most victories in program history. The doubles efforts started strong as Tefel and Orhon defeated their Bucknell opponents 6-3 at the No. 1 spot. The team of Lakshmanan and Jagtiani then won 7-5 at No. 2 doubles, while senior Hamza Laalej and freshman Xandy Hammitt closed out doubles against their competition, 6-3 to secure the doubles point. Moving into the singles competition with confidence, the team didn’t hang around in asserting dominance at the top five ladder positions. In singles play, Laleej, Lakshmanan, Orhon and Jagtiani all battled for three-set victories at the top four positions. Tefel closed out the scoring at No. 5 with a straight-set victory over opponent Ben Gerber. The men’s team will line up next against Colgate University and the University of Connecticut during their spring break training trip March 11-12. As always, students can follow their progress at www.DrexelDragons.com or live on DrexelDragons.tv.